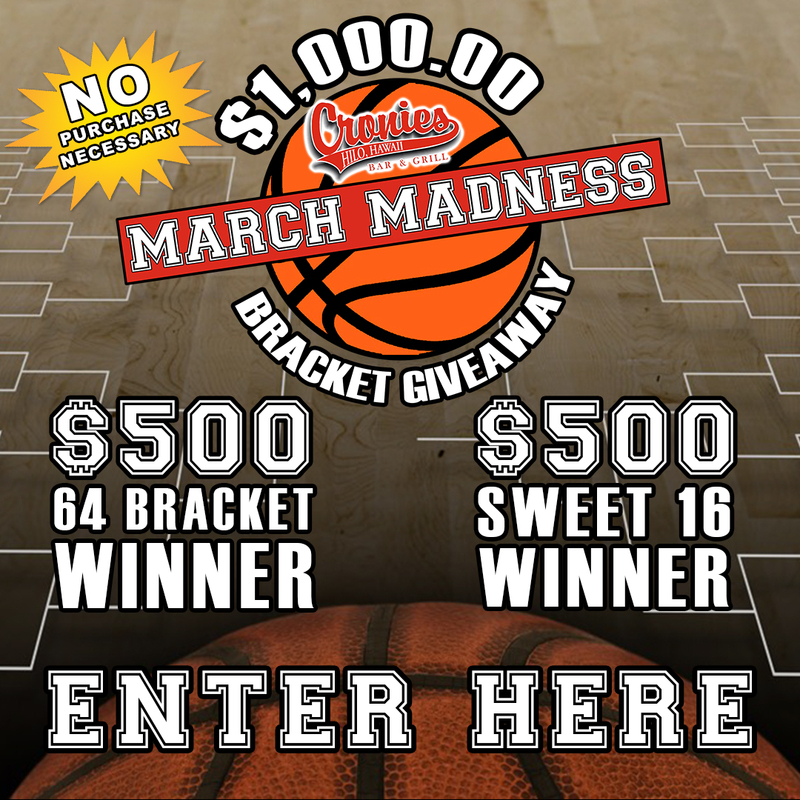 To enter, pick up a Bracket Code at Cronies Bar and Grill at 11 Waianuenue Ave. during regular business hours. One Bracket Code per person, per day. Additional Bracket Codes can be obtained by sharing social media posts via Facebook and Instagram. See social media posts for details. Once Bracket Code is obtained, goto www.CRONIESHAWAII.com, click on the March Madness Giveaway link, enter code and set-up bracket. Multiple brackets can be entered by the same person using a newly obtained code. No purchase is necessary to obtain a Bracket Code to enter. The winner is determined in both 64 Bracket Giveaway and Sweet 16 Bracket Giveaway by having the most points at the end of the contest period. A tiebreaker feature has been added when each bracket is entered. Cronies Bar and Grill March Madness Bracket Giveaway runs through April 8th, 2019. The winner will be announced and contacted by April 9th, 2019. The winner of the 64 Bracket Giveaway wins $500. The winner of the Sweet 16 Bracket Giveaway wins $500. You must be a Hawaii Island resident with a valid photo ID and present proof of Hawaii residency. You are responsible for any and all taxes on your winnings. You will be required to provide your Social Security number, which will be used to disclose your winnings to the IRS and you will be required to sign a release of claims form. Cronies Bar and Grill will not be responsible for any loss, theft or injury associated with this contest. No employees of Cronies Bar and Grill can enter this contest. Winner agrees to allow Cronies Bar and Grill to utilize any voice, video or photo likeness for promotional purposes.